For those seeking asylum, getting across the Canadian border is a difficult journey. However, once they're across another daunting task begins — filling out form after form justifying why the refugee claimant is in need of protection. For those seeking asylum, getting across the Canadian border is a difficult journey. Since April 2016, more than 400 people have crossed irregularly — meaning they walked across the border through fields, often through deep snow, while braving the bitter cold. But it's not until they're across that the real work begins. Ghezae Hagos is the in-Canada protection counsellor at Winnipeg's Welcome Place. He said refugee claimants have to fill out pages upon pages of documents in hopes of staying in Canada. 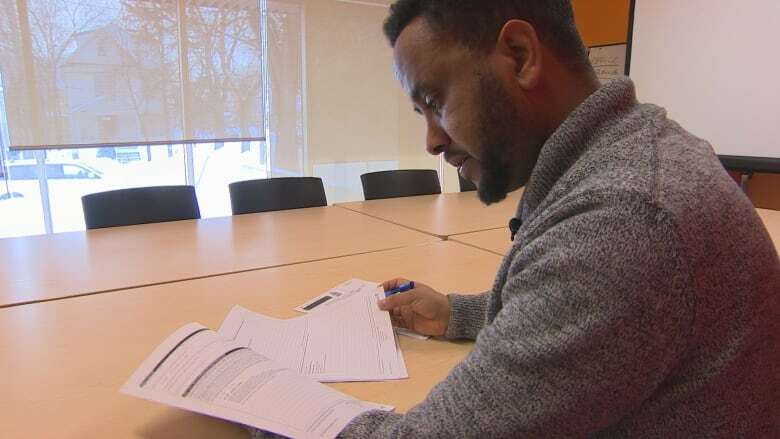 "They have to tell in detail what would happen to them, why they are asking for protection in Canada, why they can't return to their country of origin, why they did not ask for protection from their country," said Hagos. They can qualify for asylum either as a convention refugee, which is the United Nations' definition, or as a person in need of protection. A convention refugee is a person who has a well-founded fear of persecution based on their race, religion, political opinion, nationality or membership in a group, such as women or people in the LGBT community. Persons in need of protection face the danger of torture, risk to their life or the risk of cruel and unusual punishment if they returned to their home country or the country they were living in. "We need to know that they want the same thing that all of us want, that is to live a peaceful and productive life," said Hagos. Have you or your family ever been harmed, mistreated or threatened by any persons or group? If you returned to your country, do you believe you would be harmed, mistreated or threatened by any persons or group? Did you ask any authorities such as police, or any other organizations in your country to protect or assist you? Did you move to another part of your country to seek safety? When did you leave your country? Why did you leave at that time and not sooner, or at a later time? Did you move to another country (other than Canada) to seek safety? Give any details that you think are important for your claim for refugee protection. It also asks if the applicant has any previous protection claims, visas or children. The basis of claim form must be submitted within 15 days of being declared a refugee claimant. Abdi Ahmed applied for refugee status in 2003. He said he came to Canada to escape war in Somalia. Now he helps new refugee claimants from his home country fill out their paperwork. 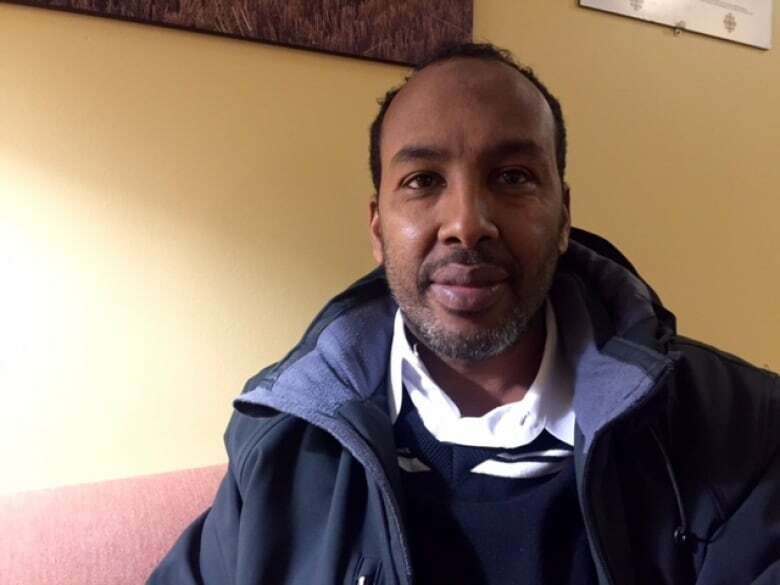 Abdi Ahmed came to Canada as a refugee claimant in 2003. Now he helps asylum seekers from his home country of Somalia make their claims. (Jillian Taylor/CBC)"I am able to have trust because I speak the language and we are the same community," he said. Abdi said trust is crucial when it comes to divulging the personal details required by the forms. He said he's seen claimants' applications denied because they left out critical details. It's common for people who have been persecuted by their governments to have a lot of mistrust, Abdi said. And sometimes LGBT claimants are too afraid to acknowledge their sexual orientation. "This is a very sensitive issue and many people who are coming out for the first time are not able to put this information out to an individual they don't know," he said. Language is also a barrier. Sometimes things get lost in translation and important details don't get written down, Abdi said. "I do this for my community, because if we don't do this they won't have someone to translate into Somali from English." Once a person is accepted as a refugee claimant, they qualify for the Interim Federal Health Program and social assistance, and can apply for a work permit. 'I want to die,' 2-year-old refugee said during hours-long walk to Manitoba from U.S.
Hagos said the refugees get food, clothes and household items by donation.They get less than $300 a month for rent under social assistance and usually end up living with several other refugees to cover monthly costs. "One of the things they usually ask me when they come is, 'When can I start working, when can I get [a] work permit?'" said Hagos. "That shows they don't want to be a burden on anyone." He said it can take anywhere from two to four months to get a work permit. The application process is faster if the claimant has a passport, but Hagos said most arrive in Canada without one. He said they also have to see a doctor before applying. "They have to apply for their medical and then wait for the results, and there are only two medical examiners in the city," he said. "I don't think anyone wants to come to Canada for welfare. That is actually a big misleading stereotype," he said. "Work is one of the biggest [priorities] for them."